Form the area you plan on pouring and stamping accordingly. When using integral color, add the specified amount of color per yard as premeasured by the bucket, and have them mix for a minimum of 5 minutes or until mixed thoroughly. With Integral Color, you don't have to over work the surface which is a common problem with Color Hardeners in freeze thaw environments. Bull float the surface until it closes up and you're ready to stamp. 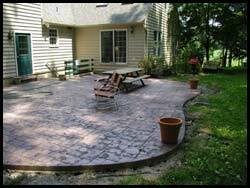 When the concrete is ready to stamp, apply your desired release agent to the surface with either a brush, burlap bag or by hand. Your release agent acts as barrier between the concrete and your stamps, while giving you that antique appearance after washing off. The benefit of the Stampcrete stamp would include the authentic appearance you receive as well as the durability in the stamp it self. This gives the contractor more time to complete a quality project as shown. Using a regular garden hose and scrub brush, remove the desired amount of release to your liking, leaving enough to accent your joint lines and achieving an antique appearance. 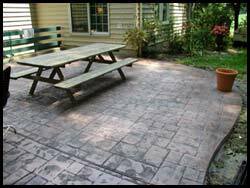 After the surface is completely dry and free of moisture, apply two coats of either solvent base sealer. This can be either sprayed on with a Chapin Sprayer or rolled on. What you have as a result is a aesthetically beautiful surface that anyone would be proud to own.